Choosing your kitchen benchtop is one of the most important decisions you will make in your kitchen renovation. It is the surface you will interact with the most on a daily basis. Marble is a beautiful material and many people are attracted to it because of its sense of luxury and grandeur. But marble can be expensive and the maintenance can be off-putting. Technology and vision have led many bench top manufacturers to create and replicate marble alternatives. Below we will discover what marble is, our favourite choices and the pros and cons of marble. We will also analyse and choose our favourite marble alternatives from the range of companies that produce marble replica bench tops. Marble is a natural stone that has been formed below the earth’s surface for millions of years. Marble is composed of calcium carbonate, and gets its colour variations due to impurities found within the earth. Marble is quarried in many countries, but the best quality marble is closely associated with Italy. Marble is unique in that no two slabs are ever exactly the same due to natural variations in the stone. Natural veins occur when there is a different mineralogical composition and create contrast in the stone that many designers and home owners are attracted to. Marble is timeless as it is an expression of nature; authentic and individual where the flaws of nature are expressed and celebrated. What are the Pros and Cons of Marble? The advantages of marble are its natural beauty and its luxurious appeal. Each slab of marble is unique and you can choose it before it gets installed. 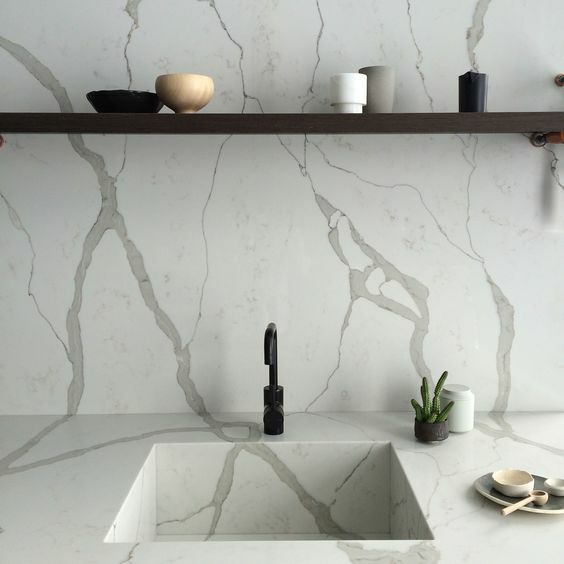 This personalisation means the marble is connected to your taste and space. Your kitchen bench top will be truly unique. Nature. Whilst it is one of marbles most celebrated features, is also one of its downfalls. It is a natural product, and as such is porous and can soak up stains and spills (red wine, acidic juices etc.). It is also a softer material than granite or manufactured stones, so it can chip and break more easily. You will need to seal marble at least every 6-12 months, so it does require more maintenance. Whist marble is a truly striking natural material, it is going to show more wear and tear than other surfaces. If you can live with this, then it’s a luxurious choice, but if you are after a bench top that requires less care and maintenance it may not be the best choice for you. 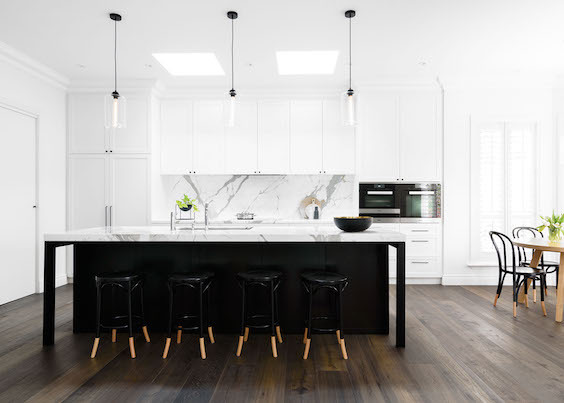 When it comes to marble bench tops, images of the grand Calacatta marble grace magazine covers and social media. This is a premium marble with a premium price tag. We couldn’t leave this beauty out of the list as it’s one of the most well-known marbles. It showcases brilliant whites with grey veining which is accented by gold hues. 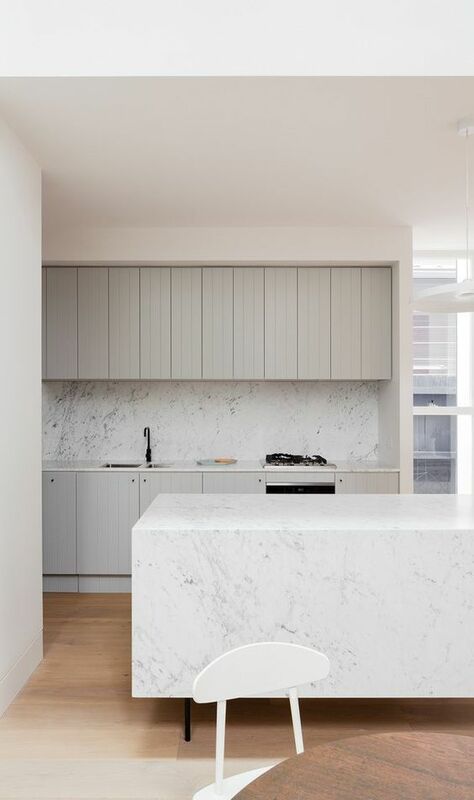 Expect to pay a hefty price tag for Calacatta bench tops. 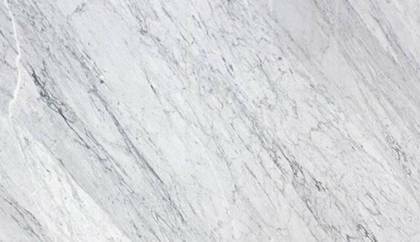 Carrara is Calacatta marble’s more economical sister. 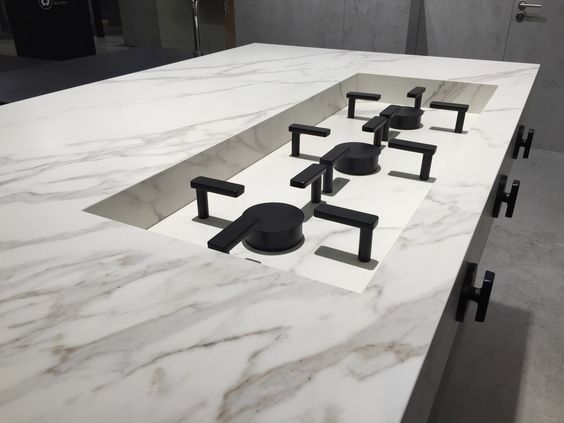 When it comes to affordability, Carrara is much more digestible. Whilst it doesn’t have the brilliant and clean whites of Calacatta marble, it is also more forgiving in terms of stains, wear and tear etc. An affordable option with timeless appeal. The images below show different slabs of Carrara. 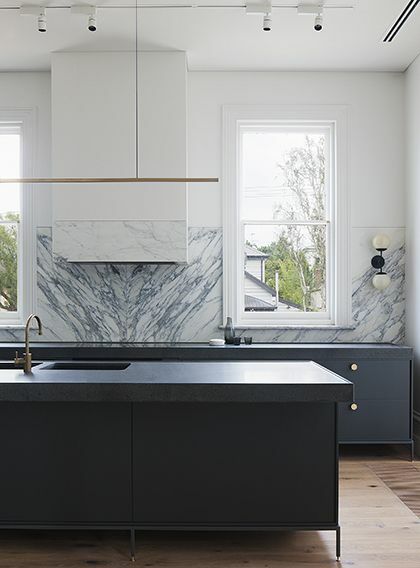 This marble has so much depth and character, we had to include it in our favourite list. It is not that well known, and sits midway in terms of pricing. Below are examples of Arrabescato Vagli, the marble showcases dark and striking veins. Many companies have realised the appeal and luxury that marble provides, and as such have created alternative options. Nearly all of the alternatives are more durable and hard wearing, and in many cases more cost effective. The advantages these bench tops have over real marble is durability, maintenance, and price. The disadvantage is that some designs and patterns may not look as realistic as the real thing. The pattern is typically printed onto the stone or porcelain, so it is only on the surface, and a small white join line may be visible at junctions. They also do not have the unique and individual qualities of marble slabs. 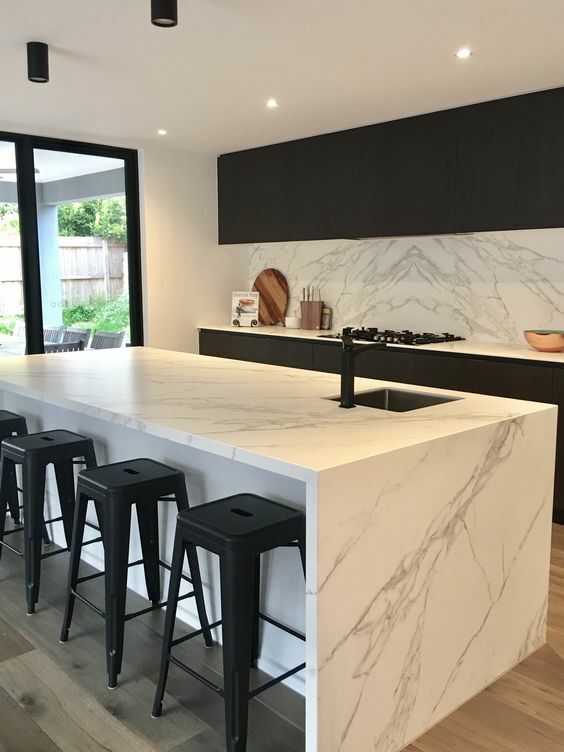 Most of the prefabricated stone including Caesarstone, Quantum Quartz, SmartStone, and Talostone have a ‘natural’ stone range that mimics the veins and colours found in marble. These are typically made from a quartz composite which is durable and stain resistant. 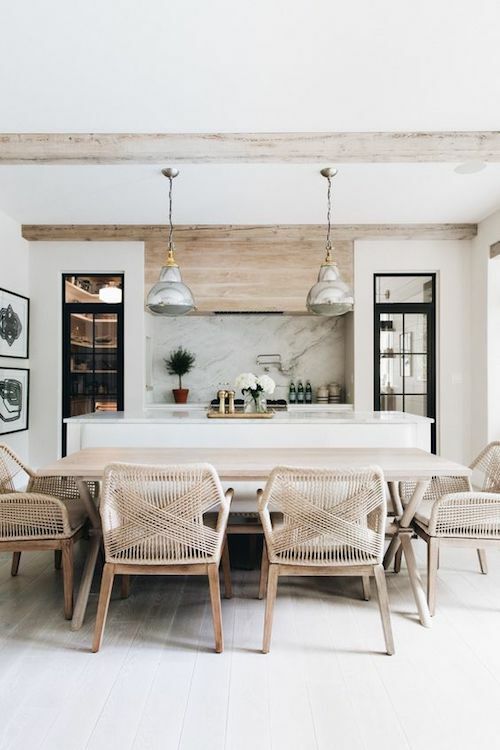 Mostly, they fall into the premium pricing range of manufactured stone, so it is still an expensive choice when it comes to comparing bench-top prices. 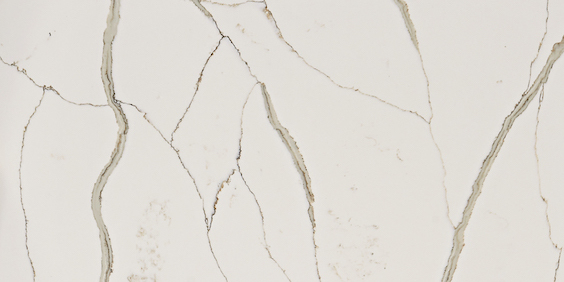 Calacatta Blanco by SmartStone features brown to grey vein lines that are highlighted with golden undertones. It is one of the more natural looking manufactured quartz surfaces available. 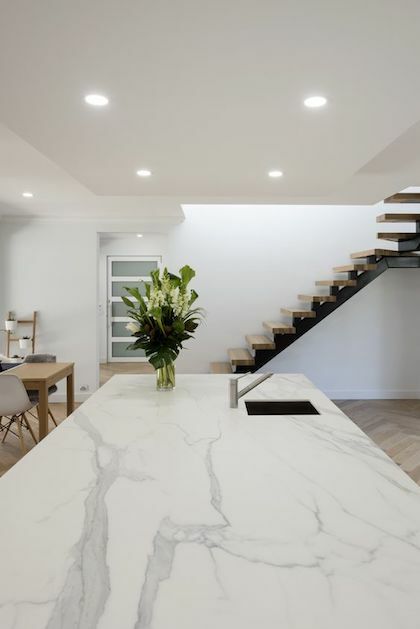 The other alternative to natural marble is the porcelain bench top, which is gaining popularity in Australia. 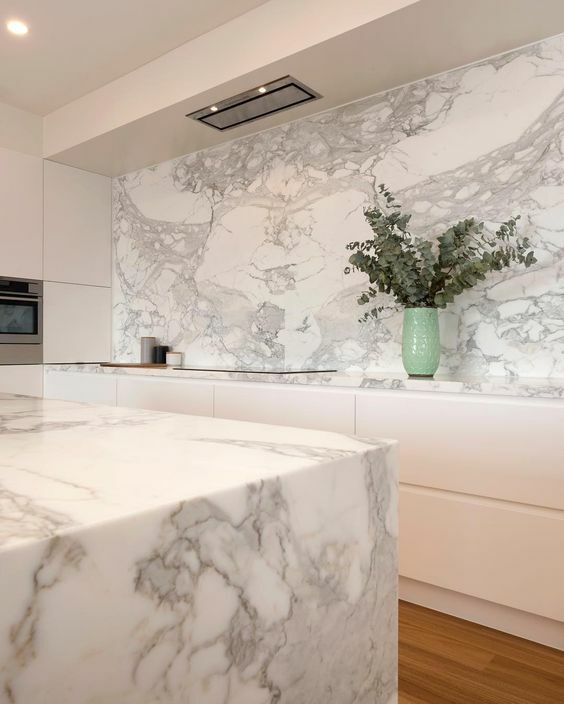 Ultra-thin and high tech, the marble effect on these bench tops are quite realistic, the marble designs are printed onto the surface of the porcelain. Here is our favourite selection of porcelain tops that immitate natural marble. 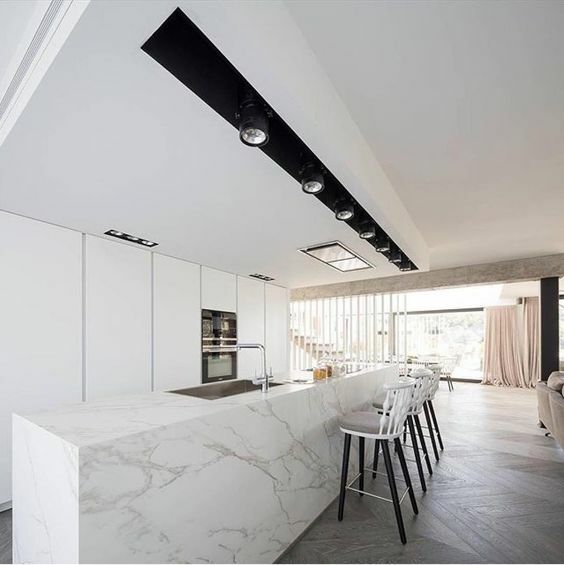 Neolith Calacatta is a porcelain bench top and a world leader in ultra compact technology. The benchtops start at 6mm thick and have won international design awards, including the Red Dot Product Design Award. A brilliant white background is evenly distributed by dark grey veins which has subtle hints of gold. In comparison to real Calcutta marble, it is more cost effective and durable. It comes in both a polished and silk finish. 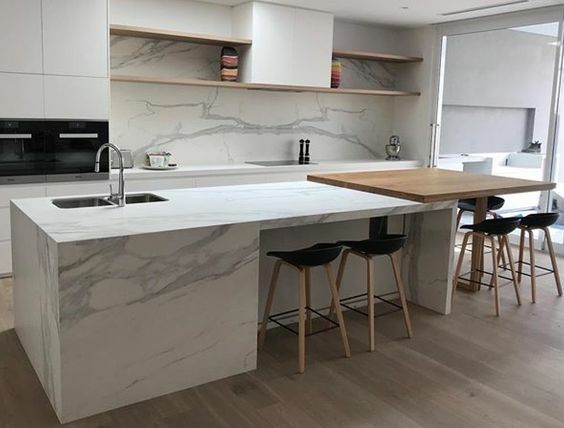 Below are some images of Neolith Calacatta. 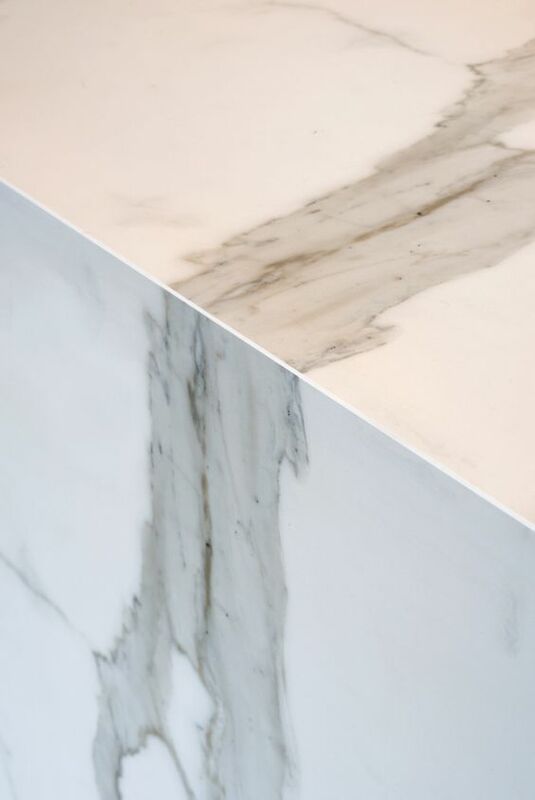 One of our other favourite porcelain marble bench tops is Estatuario by Neolith. The veins are dark grey and quite natural looking. The real beauty of marble can never be truly replicated. Technology has come a long way and many companies are re-creating marble in a realistic fashion. 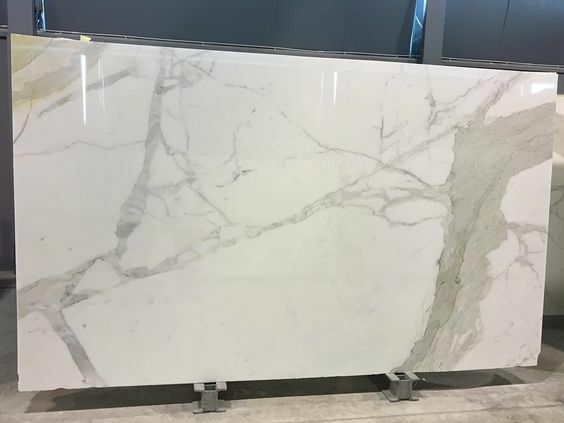 If it came down to choosing a bench top based on looks only, marble would win hands down because each slab is unique, striking, and natural. 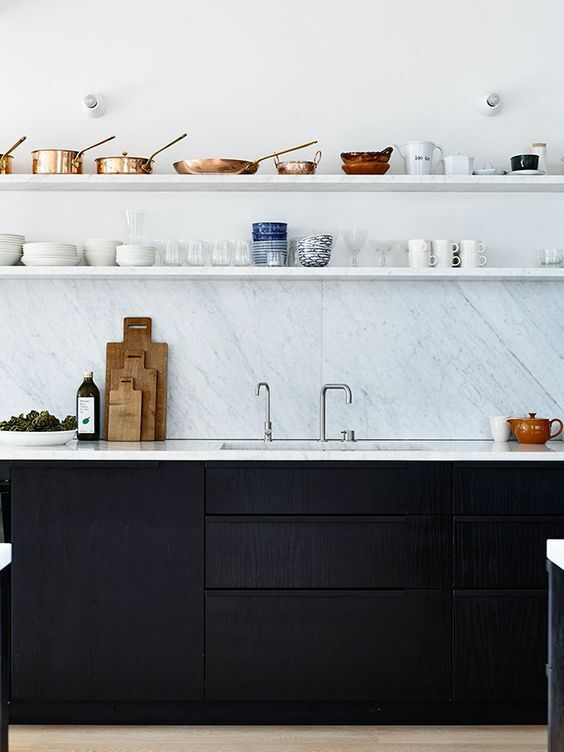 However, choosing a bench top doesn’t come down to appearances only. Price, durability, and maintenance all have a heavy hand to play in the final decision making process. 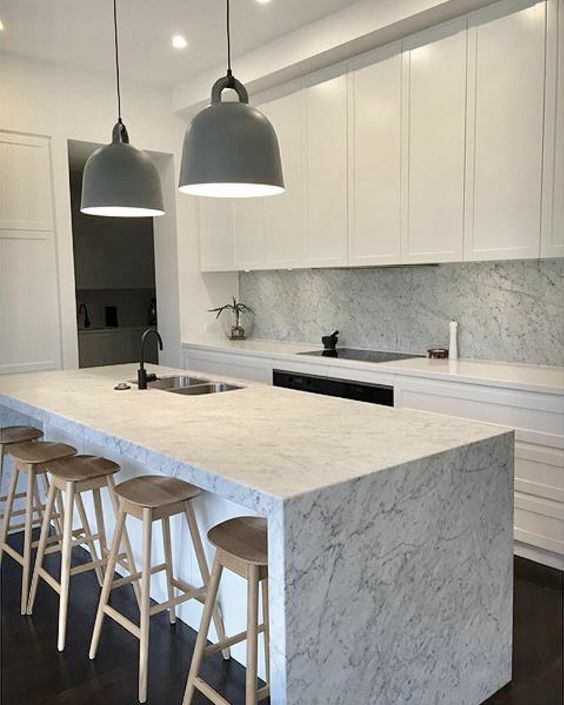 By choosing a marble alternative, such as a manufactured stone or porcelain bench top, you make not get the authenticity of real marble, but you will get something that is practical and beautiful as well as economical. Wow! The Carrara marble is gorgeous!! I’m hoping to have that in my kitchen someday.